Mara Region is one of Tanzania’s 30 administrative regions. The regional capital is the municipality of Musoma. According to the 2012 national census, the region had a population of 1,743,830, which was lower than the pre-census projection of 1,963,460. For 2002-2012, the region’s 2.5 percent average annual population growth rate was the thirteenth highest in the country. It was also the twelfth most densely populated region with 80 people per square kilometer. The neighboring regions are Mwanza Region and Simiyu Region (to the south), Arusha Region (to the southeast), and Kagera Region(across Lake Victoria). To the northeast, the Mara Region borders Narok County and Migori County in Kenya. The Mara Region is the birthplace of Tanzania’s first president, Julius Nyerere. The Mara Region was also the birthplace of Benga music. The Mara Region is home to the Serengeti National Park, one of the world’s most famous national parks. Listed as a World Heritage Site, the national park occupies a large area of grasslands and woodlands and is home to a diverse range of wildlife. It attracts close to 150,000 tourists every year. The sanctuary is home to more than a million wildebeest, 200,000 zebras, and 300,000 Thomson’s gazelles. Apart from conventional tourism in the park, there is also a range of ecotourism opportunities available in the Mara Region. Musoma is a city in Tanzania. It is the capital of Mara Region, one of the administrative Regions of Tanzania. The city sits on the eastern edge of Lake Victoria, close to the International borders of Tanzania with Kenya and Uganda. Musoma is located approximately 60 kilometres (37 mi), directly south of the geographical point where the borders of the three East African countries intersect. The town is located approximately 225 kilometres (140 mi), by road, northeast of Mwanza, the nearest large city. Musoma lies approximately 480 kilometres (300 mi), by road, northwest of Arusha, the location of the headquarters of the East African Community. 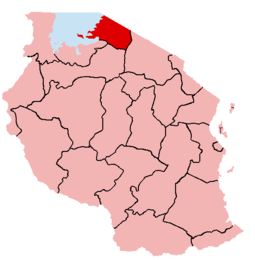 The coordinates of Musoma are:1° 30′ 0.00″S, 33° 48′ 0.00″E (Latitude:-1.5000; Longitude:33.8000). Lake Victoria (Nam Lolwe in Luo; “Nalubaale” in Luganda; Nyanza in Kinyarwanda and some Bantu language) is one of the African Great Lakes. The lake was named after Queen Victoria by the explorer John Hanning Speke, the first British to document it. Speke accomplished this in 1858, while on an expedition with Richard Francis Burton to locate the source of the Nile River. With a surface area of 68,800 square kilometres (26,600 sq mi), Lake Victoria is Africa’s largest lake by area, and is also the largest tropical lake in the world. 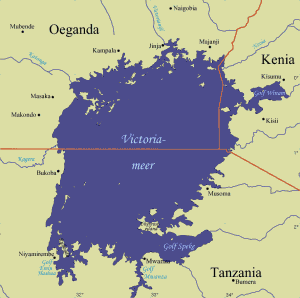 Lake Victoria is the world’s second largest freshwater lake by surface area; only Lake Superior in North America is larger. 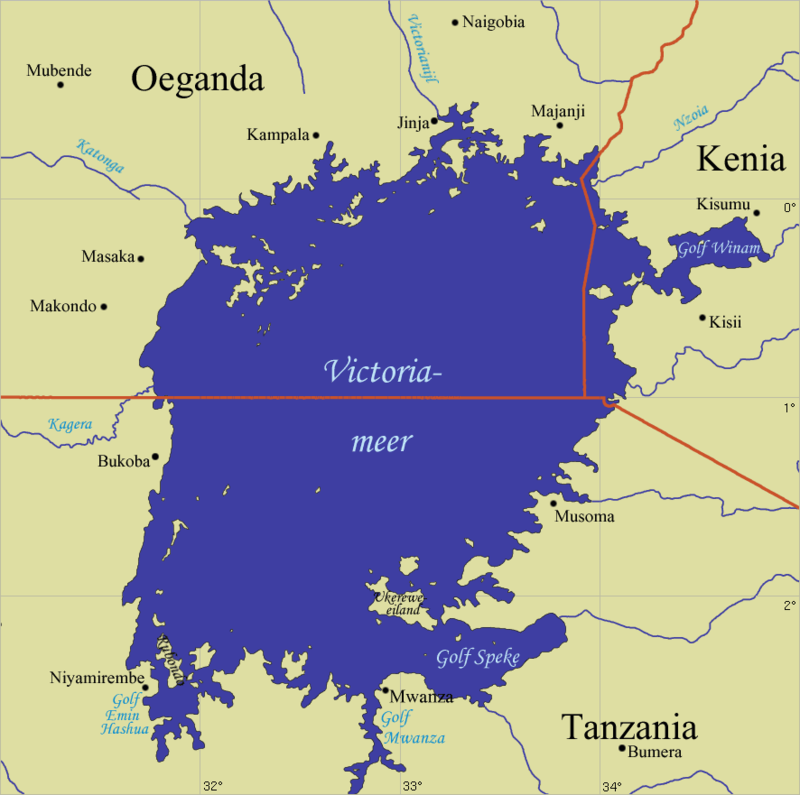 In terms of its volume, Lake Victoria is the world’s ninth largest continental lake, and it contains about 2,750 cubic kilometers (2.2 billion acre-feet) of water. Lake Victoria receives its water primarily from direct precipitation and thousands of small streams. The largest stream flowing into this lake is theKagera River, the mouth of which lies on the lake’s western shore. Lake Victoria is drained solely by the Nile River near Jinja, Uganda, on the lake’s northern shore. Lake Victoria occupies a shallow depression in Africa and has a maximum depth of 84 m (276 ft) and an average depth of 40 m (130 ft). Itscatchment area covers 184,000 square kilometers (71,040 sq mi). The lake has a shoreline of 4,828 km (3,000 mi), with islands constituting 3.7% of this length, and is divided among three countries: Kenya (6% or 4,100 km2 or 1,600 sq mi), Uganda (45% or 31,000 km2 or 12,000 sq mi) and Tanzania (49% or 33,700 km2 or 13,000 sq mi). The first recorded information about Lake Victoria comes from Arab traders plying the inland routes in search of gold, ivory, other precious commodities, and slaves. An excellent map, known as the Al Idrisi map from the calligrapher who developed it and dated from the 1160s, clearly depicts an accurate representation of Lake Victoria, and attributes it as the source of the Nile. The lake was first sighted by a European in 1858 when the British explorer John Hanning Speke reached its southern shore while on his journey with Richard Francis Burton to explore central Africa and locate the Great Lakes. Believing he had found the source of the Nile on seeing this “vast expanse of open water” for the first time, Speke named the lake after Queen Victoria. Burton, who had been recovering from illness at the time and resting further south on the shores of Lake Tanganyika, was outraged that Speke claimed to have proved his discovery to have been the true source of the Nile, which Burton regarded as still unsettled. A very public quarrel ensued, which not only sparked a great deal of intense debate within the scientific community of the day, but also much interest by other explorers keen to either confirm or refute Speke’s discovery. In the past, the famous British explorer and missionary David Livingstone failed in his attempt to verify Speke’s discovery, instead pushing too far west and entering the River Congo system instead. Ultimately, the Welsh-American explorer Henry Morton Stanley, on an expedition funded by the New York Herald newspaper, confirmed the truth of Speke’s discovery, circumnavigating the lake and reporting the great outflow at Ripon Falls on the lake’s northern shore.